Indianapolis City Hall is located at 200 East Washington Street (City County Building), Indianapolis IN 46204; phone: 317-327-5014. Photo: Morris-Butler House, ca. 1864. 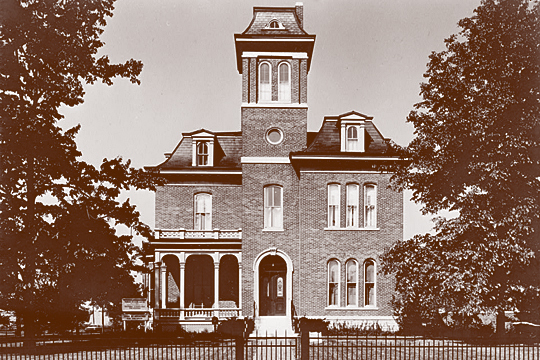 The house is one of a few surviving examples in Indianapolis of a mid-nineteenth century Victorian house, French and Italianate in its architectural details, built for a successful businessman of the period and his family. Jack E. Boucher, photographer, 1970, Historic American Buildings Survey [HABS IND-52]. memory.loc.gov, accessed September, 2012. Indianapolis is, today, virtually co-extensive with Marion County. References to towns and townships within the county are for historical reference. With the admission of Indiana to the union in 1816, Congress had made a donation of four square miles of land for the site of a capitol wherever the State might choose. Indiana's capital had moved with the State's growing population, first at Vincennes, and then to Corydon; however, in January 1820, a reluctant General Assembly, realizing that Corydon was an inconvenient location for a capitol, appointed a commission for the selection of a permanent seat of government. Politics dictated a central location, but transportation needs of the era demanded a riverside location. These two criteria seemed to determine a site on the White River near a trading station operated by William Conner. This commission met at Vincennes in May 1820 and ascended the River, investigating many sites along the way. Eventually, the commission returned to the confluence of the White River and Fall Creek and decided to locate the capital there. The site was ideal for future milling sites and the level landscape promised both ample farmland and room for extensive urban expansion. However, the site was plagued by swampy creeks and bayous, which would ultimately affect the City in many unforeseen ways. The General Assembly approved the site selection on January 6, 1821; however, the Assembly argued for many days concerning the name of the new Capital. The names of many Native American chiefs were proposed; however, Jeremiah Sullivan proposed a hybrid English-Greek name meaning "the city of Indiana". After some initial derision but little opposition, the new state capitol was named Indianapolis. The area selected for the new capitol was not uninhabited by settlers. William Conner had set up his trading post (now the Conner Prairie Pioneer Settlement) north of Marion County in 1806. Jacob Whetzel and his son Cyrus settled in the bluffs of the White River in 1819. George Pogue, a blacksmith, allegedly settled in Marion County in 1819; however this claim is disputed. Indiana had been a state for four years when, in early 1820, John and James McCormick packed up their families and proceeded north, from Connersville. Finding a suitable location along the east bank of the White River, near the location of the present day Washington Street Bridge, the McCormick families built a log cabin, and, traditionally, became the first settlers of Marion County. Planning came to Indianapolis shortly thereafter in the form of two surveyors: Alexander Ralston and Elias Fordham. Ralston was associated with Pierre L'Enfant's survey of Washington D. C., and Fordham had close ties to English settlements in Illinois. Ralston and Fordham laid out the city on a grid, a mile on each side. At the center, on a rounded hill of sugar maples, they placed a circular street as the site for the Governor's residence. The residence was constructed but never occupied, since the activity of the Circle made the location unsuitable for a family residence. Finally, four diagonal streets were added, each ending a block short of the Circle. In those early days, the form of the City began to take shape. Malaria, caused by the mosquito infestation around Pogue's Run and White River, devastated early settlers and pushed residential construction to the north and east away from those swampy marshlands. Property along Washington Street attracted speculators, who often purchased lots on hopes of the higher future prices demanded for commercial property. The riverfront area developed into a commercial and industrial area, with a scattering of working-class homes. While the sales of lots associated with the original Donation were brisk, Indianapolis remained, at most, a pioneer village until 1824, when the Capital arrived from Corydon on a 4-horse wagon after a 10-day journey. The population of Indianapolis was between 400-500 people by the end of 1821; however, the delay in relocating the capital caused the forfeiture of property, purchased on a speculative basis. The economy of the City became based around agriculture, and most of those not engaged in agriculture were employed in food processing. By 1822, the town had a gristmill, two sawmills, three groceries, two mercantile houses, several small workshops, and seven taverns. Department of Metropolitan Development, The Comprehensive Plan for Marion County Indiana: Indianapolis Insight, 2002, Indianapolis, www.indygov.org, accessed September 2007.